Mrs. Primary Ignition is a youth librarian. As such, every year she attends the annual children’s literature breakfast put on by Anderson’s Bookshop. I’ve been lucky enough to go with her twice. 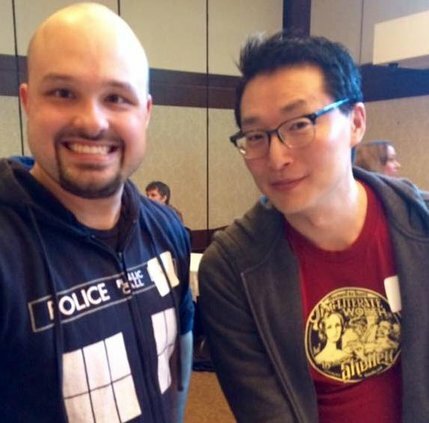 Both times, we’ve been lucky enough to be in the company of Eisner Award winning artist Gene Ha. Because the guy is just that talented, he sits there and does personalized sketches of people at the convention. Last year, he was actually sitting at our table. We happened to mention we were going to The Lego Batman Movie later that day. 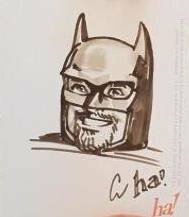 So he drew yours truly under the Lego Batman helmet. Then this year, he drew my wife. I wouldn’t presume to speak for Mr. Ha, but I’d say she made a much better subject than I did. If you get the chance to be drawn by an Eisner Award-winning artist, you jump at it. All the more so if that artist happens to be Gene Ha. For more from Gene Ha, check out the first volume of Mae, and check out the first issue of the new Mae series from Lion Forge Comics when it hits comic shops on June 20. Mr. Ha is on Twitter at @GeneHa. This entry was posted in Fanboy Flashback and tagged Anderson's Bookshop, Anderson's Children's Literature Breakfast, Batman, Gene Ha, Lego Batman, Mae (Dark Horse Comics), Mrs. Primary Ignition, Rob Siebert, The Lego Batman Movie on 04/13/2018 by primaryignition. 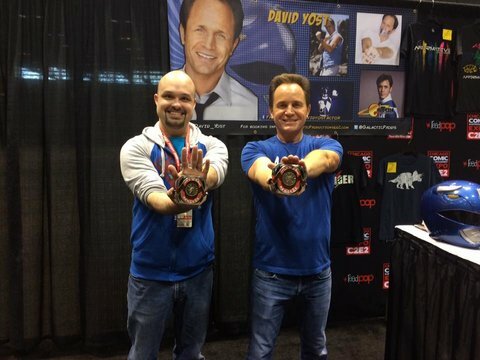 Not long ago, C2E2 announced that David Yost will be back this year. My understand is that he’ll be at the BOOM! Studios booth. Yost, of course, played Billy on Mighty Morphin Power Rangers back in the day. This shot is from last year’s convention. That smile on my face is completely genuine. Yes, I’m a Power Rangers geek. And yes, there’s a fair amount of nostalgic warm fuzzies involved. But he was also one of the most down-to-Earth and friendly people I’ve met at one of these signings. David looks you in the eye when he talks to you. You get an actual human moment with the guy. That’s not nearly as common as it should have been. As I recall, I saw him drinking out of a Starbucks cup. Being a barista myself, I asked him what his drink was. Venti black iced tea unsweetened. David Yost: A great guy with a boring beverage. We’ve got to at least put some lemonade in there, dude. This entry was posted in Fanboy Flashback and tagged Billy Cranston, BOOM! Studios, C2E2, David Yost, Mighty Morphin Power Rangers, Rob Siebert, Starbucks, Venti Black Iced Tea Unsweetened on 03/17/2018 by primaryignition.